Every business that is growing grapples with the decision around the best business systems for managing its expanding business operations. A proper planning of an integrated business software system generally takes a flipside for the short-term revenue acceleration goals. As a result, there are various disparate applications which are installed at the different points in the various functional areas which in turn result in the business process inefficiencies and the software integration challenges. The questions that arise are that how did these problems arise and how can they be avoided? A company which is growing at a rapid speed can even get entangled with a complex application landscape. When a company is starting the first thing that they install is the accounting software such as the QuickBooks so that the bookkeeping can be managed. In the pursuit for hunting down more and more customers, the companies tend to put up a standalone opportunity management system with separate systems for solving the customer support issues. There are other systems like inventory management, order management and fulfillment systems which are used for addressing with the different software and spreadsheets. To increase the top-line revenue, many companies open offices at different locations and embrace the additional sales channels which result in a more sophisticated process for the ecommerce integration, recurring billing, financial consolidation etc. there are additional business software to support these processes that take the form of the standalone applications from the different vendors, homegrown applications or a variety of spreadsheet workarounds. Business that progress the systems with a period of time in this particular approach may find themselves in a poorly planned architecture which handles the short-term needs sub-optimally by holding back the company from scaling over a long term. This tangled web of siloed business software systems is known as “software hairball”. This generally inhibits flexibility, productivity which may eventually slow down the company’s ability to grow. When the company is in the process of growth the employee must operate at the best possible productivity. If the employees are down with the inefficient and the disjoint processes the errors can be increased which will take away their time from the other important duties. There are important processes like order processing, creating invoices, taking expense approvals and fulfillment that take a longer time for completion. Take an example that your employees are spending hours by entering the order information manually and a few of your employees are pulling it out from the CRM system to calculate the sales and the commissions. In the meantime, if any of the orders get cancelled the employees have to rework on the complete data. Such tasks can reduce the agility that your company may require for its growth. When a system is un-integrated, there are multiple databases overlapping and we cannot get a view of the business performance very easily. Various reports such as finance, sales, marketing and services which show the performance of the company are very crucial for an integrated view of your company’s operations. As a lot of time is consumed many of the company’s give up this kind of operations. Countless hours that has been wasted on trying to get error-free information. Eventually it’s the growth of the business that suffers based on the inaccurate information being provided. With a wide variety of applications IT actually wastes a lot of time and money on integrating maintaining and acquiring new versions for them. Once the softwares are purchased a lot of integration and maintenance is required for the different softwares to work together. On the other hand the time that can be used for the growth of the business is wasted and the maintenance cost shoots up. The key pillar for your company’s continued success is customer acquisition and revenue growth. With the increasing competition it is a compulsion for the company to provide exceptional customer experience to take their business to a different level. If the various services that the customers are expecting from you are not being provided they are less likely to be purchasing from you. Integrated software ensures that the customer is provided with the right information and the employees can access all the information that they require regarding the customers. To keep your business growing at the dramatic rates create a plan as it essential to have your business software applications integrated around a single base for code, database and the business process. There are a few advantages of designing your systems in this manner that yields huge cost savings and better business productivity. There are various key processes that need to be automated to avoid the various other resources that it may require. In an ROI study conducted by Nucleus Research the customers that are using NetSuite, the world’s leading integrated cloud business suite, found that the companies accelerated their financial close times up to 50%, increased their sales by 12.5% and inventory turns by 50% among the other efficiencies. Every business needs a real time visibility to make some important decisions from time to time. If the data is available instantly anytime and anywhere without wasting much resources it becomes very easy to take the decisions. Real time visibility will give you profits annually over a stipulated time period. When IT is not used a lot of time that was invested in various operations such as the procuring, installing and maintaining the various systems as well as the integrations between them a great amount of resources are being saved which can be used for improving the business operations. 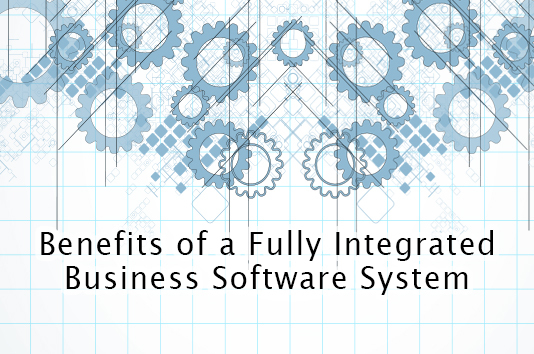 By integrating system software business can be expanded to various locations and the additional sales channels are accomplished at a faster pace due to the unified order and the accounting management processes and data. Due to this companies can up sell and cross-sell efficiently to the existing customers due to the improved visibility. As the processes are implemented quickly, the business users are able to apply their functional expertise to the tailor processes and the applications to improve the performance. On the other hand IT is focused on the strategic initiative which will add value to build up your business. Today most of the companies have installed some sophisticated business softwares to run their business smoothly. These softwares save them from the bottlenecks that they have been trying to save from ages. The integrated business software suites help in transforming how they run and they enable them to transcend the growth which was previously holding them back from taking them to the next level of growth. For deploying the Business Software System take Inspirria Cloudtech as your new cloud innovation partner with decade plus of experience working with 500+ Cloud projects. Push productivity to its optimum level with proven solutions, which is used by the best companies all over the world.